Thirty years ago this year Studio Ghibli released Grave of the Fireflies – its second full-length feature film and the first directed by its co-founder Isao Takahata. Just over a week ago, at the age of 82 and after directing what are surely five of the studio’s strongest works, Takahata died in a Tokyo hospital following what an official statement describes as his battle with lung cancer. Fifteen years ago this year, my grandfather died – after his own long list of lengthy wars against debilitating illnesses (several cancers among them) – somewhere between the home in which I spent so much of my childhood and a non-descript hospital in the east of England. Fifteen years and some distance themselves apart it is perhaps hard to see the connection between these two points. 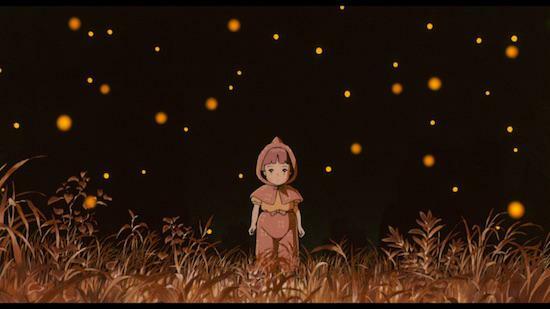 Grave of the Fireflies, as well as arguably Takahata’s masterpiece, though, is a meditation on love, death, grief, loss of innocence – or at least of youthful naivety – their looming inevitability and the ways in which both time and misguided self-preservation distort our memories. I may not remember the first time I watched Grave of the Fireflies exactly and, in truth, have not watched it since until I came to write this. I do, however, remember the night my grandfather died in excruciating detail, having played it back innumerable times in my head since then. Or, at least, I tell myself that I do. As time passes and cracks open, however, I have to ask myself if the minutiae I have clung to for so long now represent anything but an attempt to hold, white-knuckle tight, on to smoke in the open air. Were the light in that small room or the colour of his skin quite as grey as I remember? Was either actually as cold? For that matter, was the blood that ran from the corner of his mouth and which so upset my mother quite as red? Was the kiss which I was coaxed to place on his now somehow unfamiliar forehead – something I had never done in life – really so strange? Watching Takahata’s wartime opus this morning in the early hours, while I still have no answers, I am reminded of all of these questions. Of course, I hadn’t made it to thirteen without being aware that death happens. But death was always something that happened to other people – always one step removed. And, in some ways, perhaps, that’s also how it burns itself on the mind: more as a run of celluloid frames to be rewatched, a sequence of images that scratch and warp with time, than as a permanent and distinct experience in an of itself. That Grave of the Fireflies begins, then, with death – out of body, Seita removed from the thing that was once himself – looking on at one gently illuminated degree of separation, is not so much a trope of Ghibli-esque animation fantasy as it is something much more true to life. The eerie glow that differentiates the astral bodies of Seita and later Setsuko from the vibrant hues of the story as it unfolds is neither heavenly nor nostalgic – not so much a suggestion of warmth or of comfort as of lulling embers or a deep, lingering muscular ache; present but somehow barely there. For the sake of context, released in its original Japanese-language format back in 1988, Grave of the Fireflies tells the story of a brother and sister during the last days of World War II and inevitably – at the hands of air raids, disease, starvation and the very real physical manifestations of familial loss – their own lives. The death of the siblings’ mother in the opening scenes of the film provides, more so than the war which kills her, the backdrop against which the story is told: personal violence on such a small scaled held, as it so often is, closer and more sharply than the supposedly bigger narratives which are constantly unfolding around us. Adapted from the 1967 semi-autobiographical short story of the same name by Nosaka Akiyuki, though, Grave is also itself a soft-focus snapshot of an unreliably faded photograph: as adherent conceptually in form to the complex intertwining of memory and of grief as possible, emblematic of the distortions we impose – willfully or otherwise – to get by on a daily basis. It is not then a failing of the film that we never get to know Seita and Setsuko’s mother – no accident that she is never named. The strength of their bond is implied not in the brief time the characters share on screen, but in those moments that do not make it into the film. She appears, bandaged unrecognisably, a corpse, for longer than she does alive: she is a body to us for the most part, and to her children now as well. There is, in that same vein, a photograph in my parents’ living room – twinned with a counterpart in what is now solely my grandmother’s house – among others, scattered elsewhere, of my grandfather and I: an image in which we both seem happy, despite being only months from his death – even then all but certain – which perhaps to any third-person party says as much as someone might need to know about how close we might have been. The point, though, is that it does not: a photograph cannot tell you that I was raised, at least in part, by my grandparents – that my parents (who were and still are it should be said far from absent in my life) worked for most of my childhood and so I would spend almost entire summer holidays in a one-bedroom bungalow flitting between doing things that a quiet, bookish only child does and developing a nostalgic tendency for stale smoke – spending afternoons playing pool or on the fruit machines, drinking coke in the non-light of the working men’s club. You cannot know these things from a photograph any more than you can know such things from thirty-one seconds of shared parent-child screen time; these things are in the gaps between frames. There are things, though, which – thanks to the depth of Takahata’s work – we can know. As the landscape, rendered with accuracy that apparently stunned even Akiyuki, becomes ever more barren and decimated – so much more of the story set at night, so much less vital in its colour – Seita and Satsuko follow suit. The older brother becomes, despite his best attempts to hide it, something of a shadow – defined by obstinacy and a refusal to accept where once there seemed only a kind of youthful vigor – whilst his sister endures but does not comprehend. In a sense they become two split halves of the same grief – a more clearly divided version of a rending process that always comes when death comes too familiar. Much of Takahata’s film and the relationship between its two main protagonists – these two personified archetypes of grief – is defined by Seita’s refusal to confess their mother’s death to Satsuko. And in a sense, also to himself. Grief, after all, is so often defined by a denial of something we know to be true: an innate human desire to fight against the idea of an ending when the conclusion seems so at odds with the life previously known. That the news is broken to Satsuko in cruelty by the aunt having begrudgingly – if temporarily – adopted the siblings in their orphaned state, too, is far from innocuous. One way or another, acceptance is almost always forced upon us necessarily rather than arrived at. At thirteen I was old enough to know, of course, that there was no coming back from that grey room but still the minutes and hours spent expecting something – anything – other than an empty chair verge on innumerable. And in some ways that weight of expectation is still as heavy now at the age of twenty-eight as it ever was. But that chair is gone now and there are no new photographs, only old images gathering at the corners: this is acceptance – a measure of the past against the present, found wanting. Something neatly summarised in the titular fireflies and the excruciating naivety of Setsuko’s asking “Why must fireflies die so young?”: how something beautiful that, only so recently understood but in a moment expected to last forever, is so suddenly gone. Seita and Satsuko’s retreat to the eponymous cave, too, is as glaring a metaphor as Takahata – armed with an astounding degree of subtlety across the breadth of his work – has ever provided. To believe that in seclusion you can make a life for yourself, safe and never to be touched again by those cold fingers, is a closely held delusion: days and months of my own life having been spent sporadically under the cover of self-medication and self-imposed exile of another kind, smoking to the point of sickness for the sheer physical relief of it, while it’s fair to say that the cave is very rarely an actual cave, as an idea of something it is very much real. A place to bury things only so shallow as the smallest reminder is enough to trip over that disturbed ground. This is acceptance. And, yet, acceptance is so often touted as the final stage of grief. But so rarely is it discussed how it is haunted by death’s other many conspiring elements – that the much simplified denial, anger, bargaining and depression never really relinquish their grip even decades later. That cigarette smoke, the turned foil on an empty packet of painkillers, the taste of cheap and undiluted alcohol or the slow and lasting burn at the back of your throat can so easily bring everything – yet turn nothing – back. In that sense it’s possible to suggest that Takahata’s only real failing with Grave of the Fireflies is its finality – that providing an ending, painful as it may be, is something of a cop out. But this misses the point: that Grave begins and ends with death ensures that the spectre lurks throughout the entire film, imminent, omnipresent and unrelenting – as accurate a portrait as it is possible to tender.